Positano is like no other place in Italy, and maybe on Earth. This vertical village dates its origins back to Roman time and nowadays, it is a seasonal getaway for the rich and famous of this world. However, unlike Saint Tropez, Positano has been preserved from mass construction; there are very strict building rules and long story short, the village looks pretty much frozen in time, but it remains accessible to "normal" people. We visited Positano for the first time three years ago and knew we had to come back. As with any beach town, Positano is a place to relax, enjoy the sun and forget about your real life. Since the temperatures in early May don't soar, we got to spend a lot of time on our own private terrace and didn't need a pool or the sea to cool down. Apart from reading and chilling, which probably took up 75% of our time, we enjoyed walking around the town, by the beach or up the many, many steps going uphill. If the main beach gets too busy, the Spiaggia del Fornillo offers a quieter rest. When visiting the Amalfi Coast, most people take a boat to Capri for a day trip to the famous island. While we would both like to go at some point, we decided to skip it. The boat trip costs an exorbitant 60 euro return per person (including 40 euro of taxes) and we were rather afraid by the swarm of people embarking on the ferries. Our quiet terrace felt much more appealing. This is probably the first thing you need to figure out when you decide to visit Positano. The place is small and gets fully booked months in advance. While the town boasts plenty of luxurious hotels, it also offers affordable accommodations. We booked into La Tavolozza, a family guesthouse which we couldn't recommend enough: rooms come at a great price for such a fabulous central location, only minutes from the main square. As I mentioned, we also enjoyed a lovely terrace where we spent hours reading, talking and eating. Let's not forget the adorable staff, who were most helpful and friendly. One piece of advice if you come by car: ask your hotel about the parking situation beforehand as you don't want to go looping around the town looking for a spot. We didn't book a spot with the hotel and ended up in a panic realising everything was full. Thankfully, we ended up parking our shoddy rented Fiat Panda in one of the many car parks, which all cost about 25 euro a day. Last time, we stayed in a small guesthouse called Il Canneto, located on the main road that goes around Positano. It was a little far from the centre (probably a 25 minute-walk) but we had a room with a balcony offering a stunning view of the town, and parking was included. If you plan on driving along the coast and discovering the surroundings of Positano, I would recommend it. Onto our favourite topic, where to get good food in Positano. Good news; this isn't a difficult task. Positano hosts plenty of lovely places, from fancy restaurants to casual eateries and cute grocery shops where you can get fresh fruits, vegetables and takeaway food. Right by the beach, Le Tre Sorelle is a great spot for lunch. On the menu, one can find some delicious classic Italian food - the pasta with meatballs are a real hit. One night, we treated ourselves to dinner in the Palazzo Murat. We tried it three years ago and loved the high-end experience. 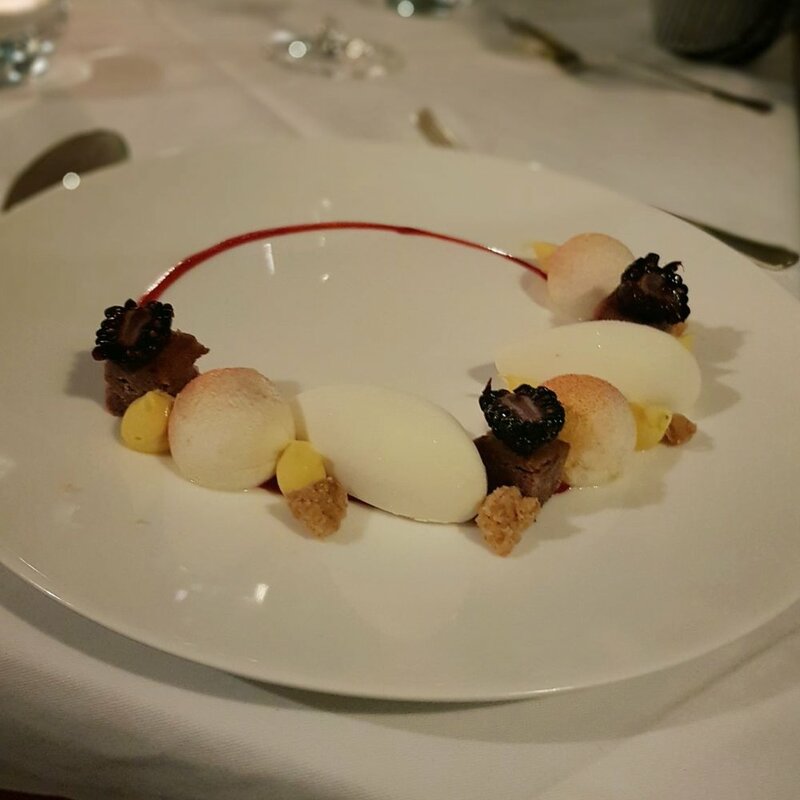 Considering the quality of the food and the level of service, you won't regret spending just a little more than in an average restaurant to get a luxurious food experience. 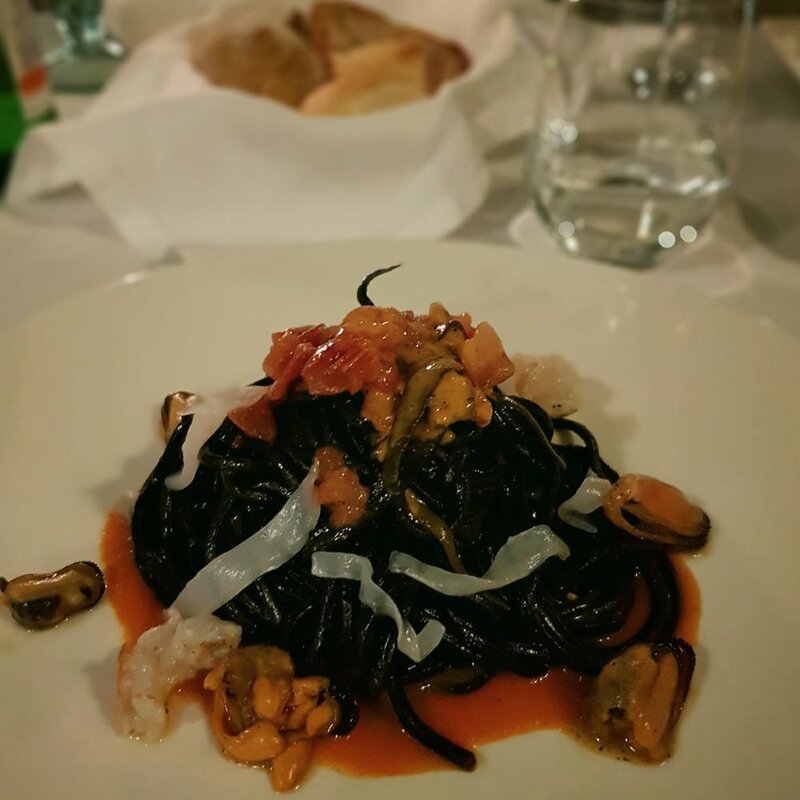 I ordered the cuttlefish ink spaghetti with seafood and Damien get the real hero of the night, the paccheri with guinea-fowl and spring onions, incredibly well balanced between the meaty flavours, the umami of the mushroom and a touch of sweetness given by a hint of orange peel. 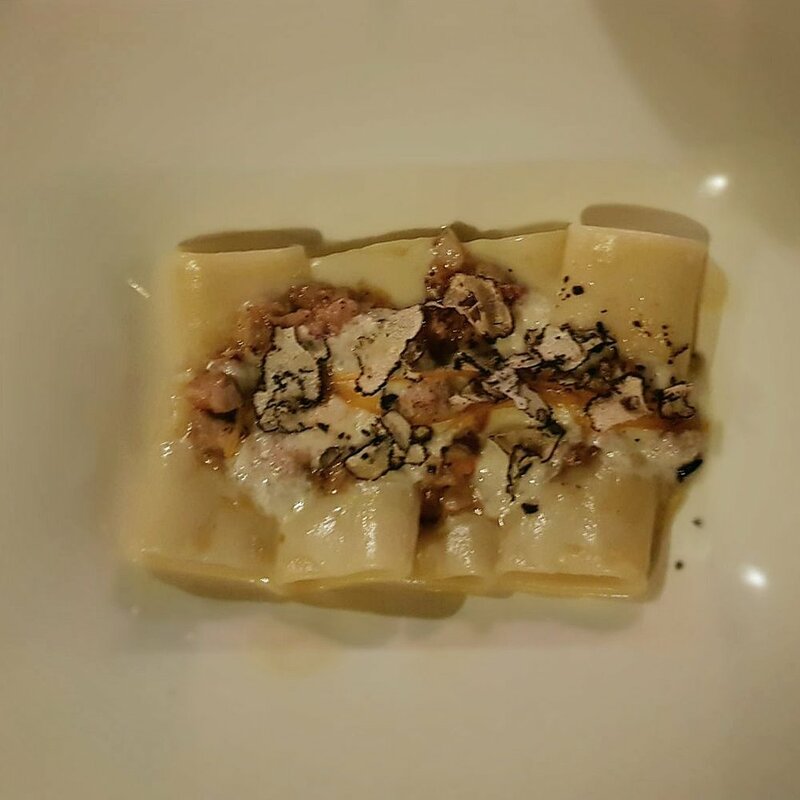 We both fell completely in love with these dishes, the perfectly cooked pasta elevated with a sublime garnish. For dessert, we shared a blackberry tart, buffalo yoghurt flavoured with lime and exotic mousse, which was absolutely exquisite, light, not too sweet, fruity and creamy. We got lucky enough to try some more creations of the Sicilian pastry chef with some delightful petit fours served with coffee, including an unforgettable chou filled with the darkest chocolate cream. For a delicious pizza, book a table at Il Fornillo. For 10 euro, you will taste a Neapolitan margherita or a more elaborate pizza while enjoying a lovely view. We picked the Boca di Bacco as our breakfast spot; in the morning, we'd order two espresso and two sfogliatelle for 6 euro, and enjoy them in front of the beach, sitting on the high chairs like the locals. A Neapolitan speciality, sfogliatelle are shell-shaped pastry filled with orange flavoured ricotta - we developed a slight addiction to them during our stay on the Amalfi Coast. La Zagara offers tasty sandwiches, pizza by the slice and the most delicious pastries have been served in this bakery for many years. We got takeaway there and ate our lunch on our terrace overlooking the sea. Delicatessen will tempt you with their ready made takeaway lunch, such as pasta bake, lasagna or aubergine parmigiana, and sells fresh fruits and vegetables as well as cold meats and cheese. It is the perfect spot to buy food for a picnic by the beach - or on your balcony. One night, we lived a pretty unforgettable experience at La Tagliata, a family restaurant located high above Positano. A shuttle bus picks you up from town and brings you to this wooden property divided between 3 terraces, surrounded by an organic vegetable garden. Don't look for the menu, there isn't one - for 40 euros, you will get to try a multitude of local and national dishes. Be prepared: you need to come with a totally empty stomach as the generous antipasti are followed by a course of vegetables (peas, aubergine parmigiana, beans), then a pasta course, then a meat course. Everything was homemade and really good, but I couldn't even go near the meat, which I felt awful about but at that stage my stomach was crying for a break. I did though try some of the desserts, including a fantastic strawberry tart. The price also included water and wine - as well as a little concert. I would recommend this place for an absolute feast with friends, maybe not a romantic dinner. Positano is a true heaven for a food lover. Whether you want to splurge or eat for cheap, you will enjoy some fantastic meals.